Thank you once again to Anne from Alberta (aka annkelliott@Flickr) for sharing one of her images with BPotD (original | BPotD Flickr Group Pool). Appreciated as always! I’m glad to find out that a jade vine specimen is still grown in one conservatory in Canada. I recall reading this article by Art Drysdale that seemed to suggest it’d be difficult to find another vine (in a public institution) after the one at Allan Gardens Conservatory was lost. 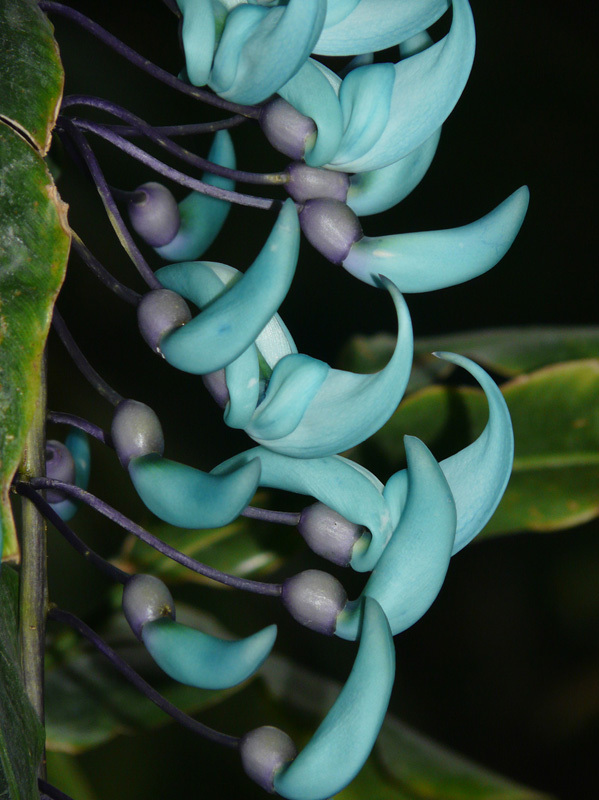 Strongylodon macrobotrys is considered one of the “vanishing treasures of the Phillippine rain forest (see: jade vine). Its decline is due to the deforestation of the dipterocarp old growth forest for timber (Dipterocarpaceae). Despite the loss of its native habitat, jade vine is widely cultivated in other tropical areas so it is not considered threatened by the scientists behind the International Legume Database & Information Service (ILDIS). The cyan or jade colour of the flowers is fairly rare in the plant world. One of the clever folks on Flickr, Morabeza79, has taken a photograph of both Strongylodon macrobotrys & Ecbolium viride in his Hawaiian garden and accompanied the photograph with links to a few of the other cyan-flowered plants. Such a beautiful flower! I wonder if it is ever grown as a houseplant or outside in southern US gardens. Philippines then is the same idea as Madagascar, an island which was isolated enough that it was almost a separate continent with its own flora and fauna. We were richer than we knew until the chain saw and globalisation arrived. Again while the pictures are beautiful the links make this site. I have seen a similiar jade vine blooming at the The McKay Botanical Gardens, a small public garden, in Vero Beach,Florida in Feb or March. It was stunning in color and length of total blooms. I believe this is the vine I saw last year at the Atlanta, Georgia Botanical Garden greenhouse. Nice photo! This is one of my favourite plants. The only specimen I’ve ever seen was in the Flecker Botanic Gardens, in Cairns, northern Queensland, Australia. If anyone’s interested and in the area in August/September. The plant is growing over a pegoda outside the toilets on the eastern edge of the gardens. Here’s a quick snap of that specimen, my photo isnt nearly as nice as Anne’s. The colours of this vine are wonderful. Nature shows us so many interesting colour combinations. At risk of sounding like a terrible skeptic, the pix reminds me of an old hand tinted photo, from fifty or sixty years ago………. Wow, nature never ceases to amaze me with her brilliance! Thank you for this beautiful picture and information! Six years ago, my husband and I saw them in a small garden outside a restaurant as we drove to Hilo on the big island of Hawaii. There was no identifying marker. We have always called them the “moon flowers” because we thought the flowers looked like pale crescent moons. To finally see a picture and learn about this plant was a wonderful surprise. It’s flowering spectacularly right now in the Cairns Botanical Gardens, Australia. Winter is the time to see it… cascading from the pergola entrance to the eastern edge toilet block. This plant just finished flowering in a garden a few doors up from us in Brisbane, Queensland, Australia! It lasted about 4 weeks or so, and was my first introduction to turquoise flowers, but as I see, it might be my only one, because I’ve not seen another flower that colour before! I saw one in Japan, when visiting. April 2006. In one of Tokyo’s Botanical Gardens. It was so unusual to me that I took a picture. Jade vine is truly amazing. I hope you can see it when it flowers and all its inflorescence wrapped around a huge tree trunk! an amazing plant that grows well in my home town near durban in south africa.very difficult to propagate?anybody got any clues for easier propagation. It is a rare color in the world of flowering plants. Ixia viridiflora (http://botanyphoto.botanicalgarden.ubc.ca/2008/05/ixia_viridiflora.php) is the only other one to come to mind, but I recall there is another plant with a bloom in a similar color from southern Africa whose name excapes me for the moment. It made me wonder if they had a common polinator that they were attempting to attract (possibly the beetle mentioned in the BPD entry). It’s Lachenalia viridiflora, mentioned in the comments section in the Ixia entry. Daniel, perhaps this is a good subject for a Botany Photo of the Day in the near future. There is a Strongylodon macrobotrys growing in the bannanna house at Longwood Gardens in Kennett Square, PA.
there is a very large beautiful plant at the miami botanical garden in florida, took some seed from the ground to germinate the plant but no result, so i bought one.